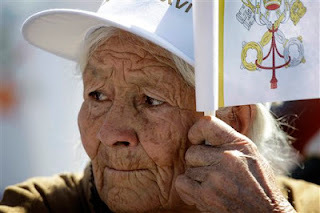 Vatican City, 25 March 2012 (VIS) - "As we now pray the Angelus and remember the Annunciation of the Lord, our eyes too turn spiritually towards the hill of Tepeyac, to the place where the Mother of God, under the title of 'the Ever-Virgin Mary, Our Lady of Guadalupe' has been fervently honoured for centuries as a sign of reconciliation and of God’s infinite goodness towards the world", said the Holy Father this morning before the Marian prayer. 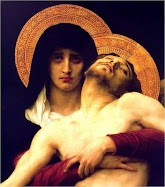 "Do not forget", he went on, "that true devotion to the Virgin Mary always takes us to Jesus, and consists neither in sterile nor transitory feelings, nor in an empty credulity, but proceeds from true faith, by which we are led to recognise the excellence of the Mother of God, and we are moved to filial love towards our Mother and to the imitation of her virtues. 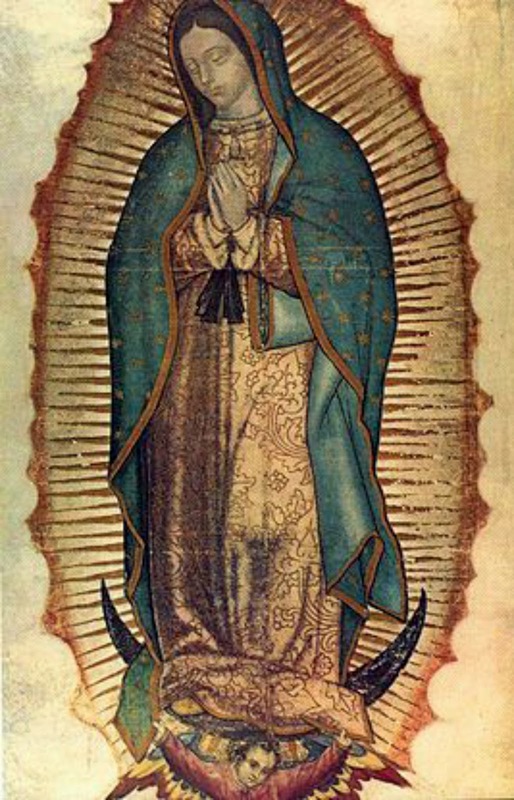 To love her means being committed to listening to her Son, to venerate the Guadalupana means living in accordance with the words of the blessed fruit of her womb. "At this time, when so many families are separated or forced to emigrate, when so many are suffering due to poverty, corruption, domestic violence, drug trafficking, the crisis of values and increased crime, we come to Mary in search of consolation, strength and hope. She is the Mother of the true God, who invites us to stay with faith and charity beneath her mantle, so as to overcome in this way all evil and to establish a more just and fraternal society. "With these sentiments, I place once again this country, all Latin America and the Caribbean before the gentle gaze of Our Lady of Guadalupe. 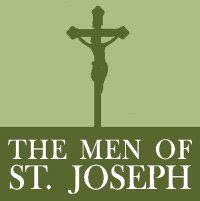 I entrust all their sons and daughters to the Star of both the original and the new evangelization; she has inspired with her maternal love their Christian history, has given particular expression to their national achievements, to their communal and social initiatives, to family life, to personal devotion and to the continental mission which is now taking place across these noble lands. 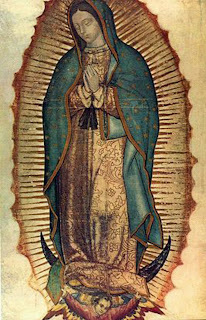 In times of trial and sorrow she was invoked by many martyrs who, in crying out 'Long live Christ the King and Mary of Guadalupe' bore unyielding witness of fidelity to the Gospel and devotion to the Church. I now ask that her presence in this nation may continue to serve as a summons to defence and respect for human life. 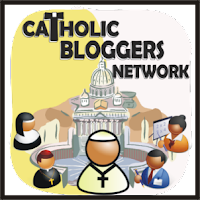 May it promote fraternity, setting aside futile acts of revenge and banishing all divisive hatred", the Pope concluded. 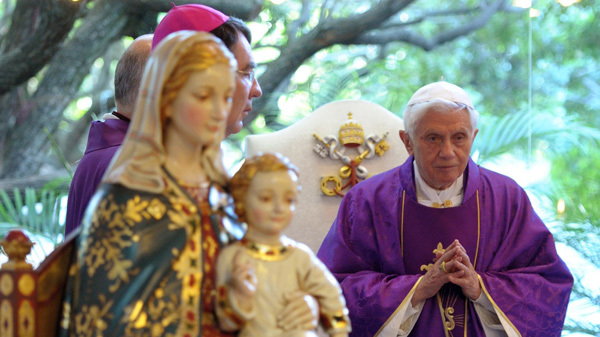 After the Angelus, Benedict XVI prayed for a few moments in silence before the image of Our Lady of Guadalupe. As he imparted the final blessing, he also blessed ninety-one images of the Virgin of Guadalupe which are destined to be displayed in all the dioceses of Mexico.